Our manufactured carton sealer machines is especially designed for carrying out the functions of folding, sealing, and strapping cartons. It has PLC control unit wherein both the sealing and strapping functions are carried out. 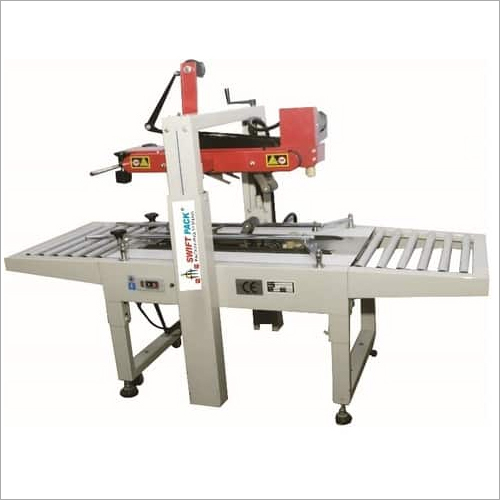 The operating speed of carton sealer is variable, which tackles the synchronization problem. Its parts and components are avant-garde and stable, which enhances the overall performance of the machine. Fast sealing speed and simple adjustment are two primary features, which makes it applicable in various industries. Our company has an associated tool room with CAD/CAM and CNC facility, which allows us to ensure precision in every job work undertaken by us. Technological innovation is a regular habit at our company, which assists us in providing latest solutions as per rising carton sealing requirements. We continuously aim to meet our clients' expectations for carton sealing machines through rigorous testing & innovation procedures. Every model of the equipment is thoroughly inspected and performance tested is also carried out to ensures its unquestionable performance.